Features over 60 thought-provoking topics and questions! Add some physical fitness and a whole lot of fun to your next icebreaker or “getting to know each other” gathering. This awesome Toss ‘n Talk-About® Ball features over 60 thought-provoking topic/questions/ideas (such as “If I won a million dollars...”, “A day I'd live over”, “A talent I wish I had”). When the ball is caught, the player answers the topic that has been selected by the position of their thumb. Perfect for one-on one sessions or group activities and easily adapted for all age and functioning levels. 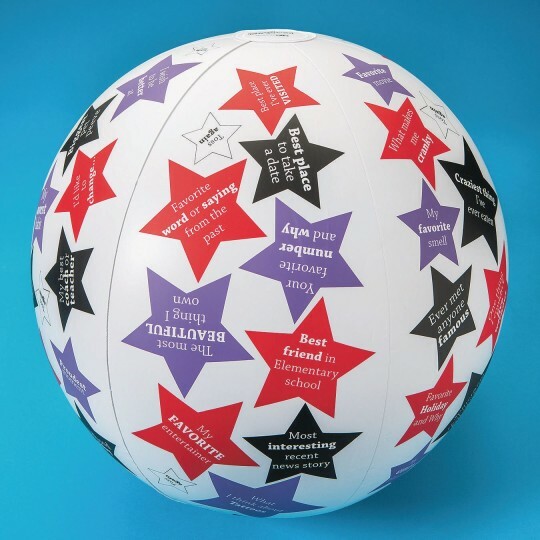 24” ball also includes a handy activity sheet with ideas for play and a repair patch.